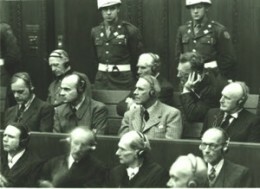 This year's Kristallnacht Commemoration will feature an original filming of the 1945 Nuremberg trials of top Nazi war criminals. Every year, Wright State University remembers the tragedy of Kristallnacht, or The Night of Broken Glass, a series of attacks against Jews in Germany and Austria on the night of Nov. 9, 1938. This year, the annual Kristallnacht Commemoration will host Sandra Schulberg, a successful film producer and professor at Columbia University. Schulberg will be screening a restoration of her father’s original filming of the 1945 Nuremberg trials of top Nazi war criminals. This film has never been shown in U.S. theatres. The event will take place on Wednesday, Oct. 26, at 7 p.m. in M252 Creative Arts Center, in the music wing. The Kristallnacht Commemoration and film screening is co-sponsored by the Zusman Chair in Judaic Studies, the Department of Religion, Frydman Education Resource Center and Dayton Holocaust Resource Center. For additional information contact professor Mark Verman, (937) 775-2461.